What was originally intended to be a fun weekend with my girlfriend at the North Carolina State Fair turned out to be quite the opposite. At the start of the day, I had car troubles and started my trip to the fair with my girlfriend pretty late. To make matters worse, once we got to Raleigh, we spent so much time trying to find parking for the fair that we gave up entirely. A few hours later, I stopped to get gas, and my car wouldn’t start which led to a grueling five hour waiting game with Roadside Assistance and Towing Companies who weren’t willing to tow all the way to High Point. We called it a night at a Hampton Inn and were able to find a tow the following morning. But, there was one part of this marvelous adventure I forgot to include: we stopped to get dinner at arguably one of the best vegetarian and vegan restaurants in the state of North Carolina, and much like the rest of the day, it was entirely by chance. Somewhere in between NC State Fair traffic and dealing with mechanical blunders, we settled on a dinner date and drove through downtown Raleigh in search of food. We decided on a place called The Fiction Kitchen, whose Google Search results bolstered it being one of the top 15 Vegetarian/Vegan restaurants in North Carolina. Without hesitation, we queued up the GPS and let my phone guide us to our plant-based Promised Land. When we found parking, my girlfriend and I made our way to The Fiction Kitchen, which was comfortably situated between a live music bar and tattoo parlor. A small crowd sat outside of the extra-large glass door scattered along benches, tables, curbs and ledges all drinking wine or local craft beer. We sifted through the group which was healthy mix of college students and people in their mid to late 40’s. Once we opened the wide glass door, a barrage of sound hit our ears – happy conversations ending with laughs and the clinking of glass floated over the faint sound of what sounded like alt-rock guitar riffs. The interior was like a scrapbook of unrelated visual cues that would be tough to make work together, but somehow, did just that. The red and orange walls had white Christmas lights lining the roof and chalkboard menus, which let me know this was something new and hip, while the retro furnishing gave off that traditional 1950’s All-American diner feel. The colorful and fun atmosphere reminded me of Greensboro’s very own Tate Street Coffee House, and I instantly felt at home in a town that I had only been to twice before. We scored a seat at the bar, ordered two drinks and scanned the entirely vegan and vegetarian menu. My eyes and mouth watered at all the amazing options I had to choose from. Fiction Kitchen’s menu was amazing, because it bolstered a myriad of non-related foods that all seemed appetizing. All the ingredients – including the meat substitutes – are all locally sourced from Raleigh and surrounding areas. Eventually, my girlfriend and I agreed to pick two menu items and split them with each other, deciding to settle on the Eastern Carolina Pulled “Pork” and “Chicken” and Waffles. 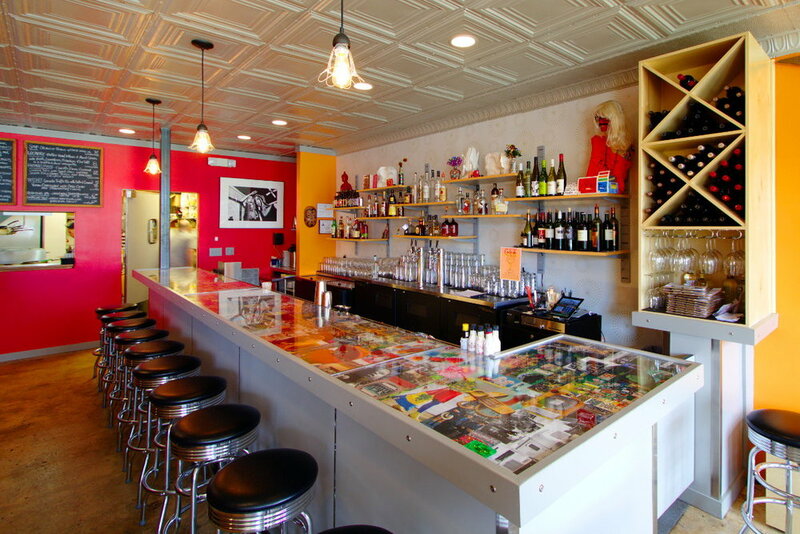 While waiting on the food, I decided to do some research on The Fiction Kitchen, and it turns out that the fun diner garnered popularity in Raleigh via its pop-up styled Vegan Sunday Brunch events. It officially set-up shop in downtown Raleigh in 2015, and is the culinary vision of Caroline Morrison and Siobhan Southern. Caroline left her life in corporate America to pursue making delicious meals and graduated with honors from culinary school, while Siobhan has used pastries and confections as an edible medium for her creative and visual arts oriented mind. Typically, I’m never blown away by food at restaurants, especially their vegetarian options, because most of it feels like something I could have made at home, but for whatever reason, I wasted my money on it at a takeout place. That was not the case with The Fiction Kitchen. The Eastern Carolina Pulled “Pork” was absolutely amazing and had the taste, consistency and full flavor of real pork. They even smoke the pork-substitute and soak it in that mouthwatering classic Eastern Carolina vinegar-based BBQ marinade. I was blown away – as I’ve been vegetarian for just over a year – and haven’t eaten pork in nearly two. This tasted just like the real deal but without all the guilt. The Pulled Pork also came with a side of mashed potatoes that melted in your mouth and Carolina-style coleslaw, which to date is the only slaw I’ve ever enjoyed. I highly recommend getting the Black Beans with Chipotle Buttermilk and Cilantro as your side of choice for maximum enjoyment of this dish. Get a little bit of everything on your fork and bless your tongue with an explosion of flavor you thought was otherwise impossible. The second round of plates contained a fried “chicken” patty sitting on top of a syrup soaked Belgian Waffle, topped with arugula. We chose to get the Spicy Sweet Chili sauce added to the “chicken,” and once again the meat substitute was just as delicious as the real thing. The crunch and spice of the “chicken” patty complimented the sweet fluffy Belgian Waffle, with both of the vastly different flavors hitting your entire tongue and bringing out the best in one another. For dessert, we tested their vegan Tres Leches Apple Cake. It was very dense and moist, making the single slice more than enough for two very full adults. The whipped icing on the top seemed to evaporate once it entered your mouth giving way to the tasty cake and apple slices that were hidden beneath its surface. Overall, the experience was amazing, and it was agreed upon that when visiting Raleigh or even passing through, that the Fiction Kitchen is somewhere that we must stop at in the future. If you want to try their amazing dishes for yourself, go check them out at 428 S Dawson St, Raleigh NC 27601. If you would like to learn more about the restaurant, you can visit their website http://www.fictionkitchen.com, like their Facebook page or follow them on Instagram @thefictionkitchen for appetizing photos and updates.